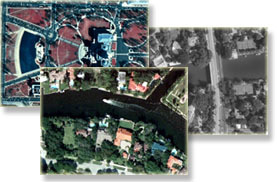 TerraFly: Digital Aerial Imagery Products"
We offer aerial photo imagery derived from USGS Digital Orthophoto Quadrangles (DOQs). Imagery has been orthorectified, i.e. altered for precise mapping. 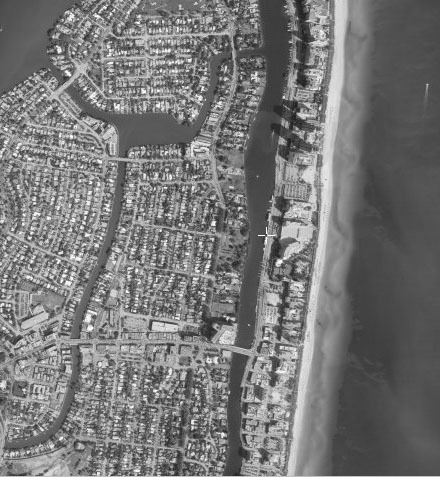 Aerial photo imagery is available over almost any area of your choice within the continental United States at 1-meter resolution or better (at 1-meter resolution 1meter=1pixel). Some urban area a available at 1-foot and better resolutions. 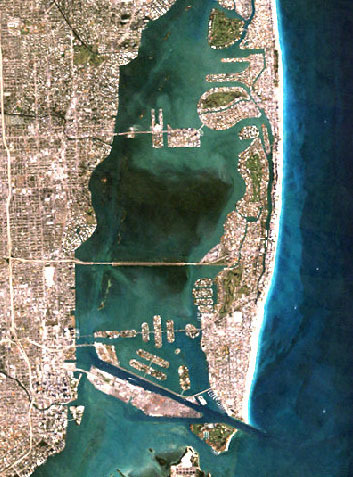 Below are samples of images, the area is Miami Beach, Florida. (Click on a sample to get a larger image). 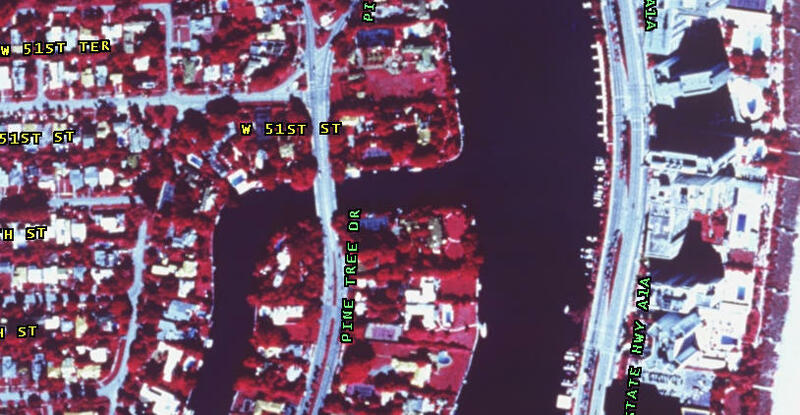 Resolution - resolution of the imagery, measured in meters/pixel. At 1m (meter) resolution 1pixel of the image represents 1 square meter of the area, similarly at 1ft (foot) resolution 1pixel=1sq.ft=0.3048x0.3048 sq.m. Base Data Type - the data source of the imagery. Currently available are USGS Landsat Satellite Natural View color composite (32m resolution and sparser), USGS Color Ortho Photo (color infra-red or natural color images), USGS BW Ortho Photo (black-and-white images), USGS Color 1ft Photo (color images at 1ft resolution) and USGS BW 1ft Photo (black-and-white images at 1ft resolution). Size - image size measured in pixels. For example, the notation 2000x1000 describes a rectangular image of width 2000 pixels and height 1000 pixels. Note, that if the resolution of this image is 1m, then the image covers 2x1 kilometers of the actual geographic area. File format - the format of the image file to be delivered to you. Two popular image formats, JPEG and TIFF, are available. These formats are supported by many software products and Internet browsers. Also available is a PDF Atlas suitable for printing as a brochure. Overlay - an additional data layer over the imagery. 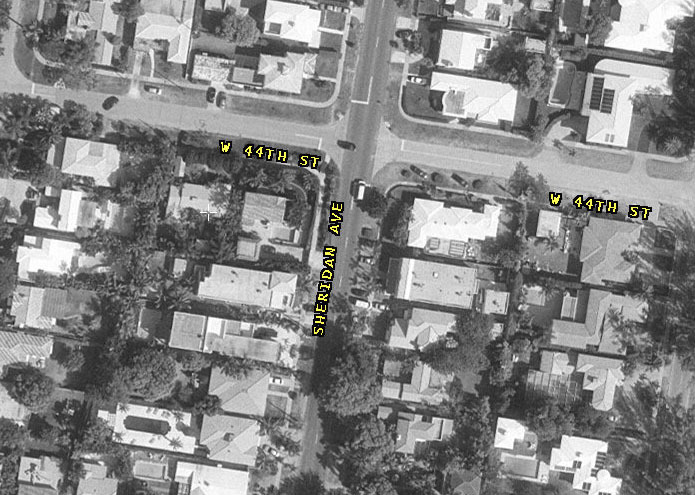 The most popular overlay is Street Names overlay, displaying street names over the image. There are two options for street overlays: NavStreets (street network data from Navigation Technologies provides the highest quality data available in North America and Europe) and Tiger streets (produced by the United States Census; while it has accurate geometry over many areas, offsets in street name labels is noticeable in many cases).